It is a generally accepted story that an ancient South American Inca tribe called the Quechua first made jerky (“ch’arki”) as early as the 1500’s. Halal Mummified Jerky blows that theory away, where it is well documented that jerky was made thousands of years ago by ancient Egyptians. Archaeologists made this discovery when they found dried foods preserved in tombs. 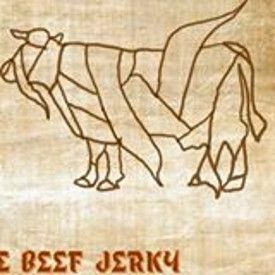 Halal Mummified Jerky is 100% made in the USA, and their beef is certified to be halal by Halal Transactions of Omaha. Halal Mummified Jerky is advertised to have no added MSG, nitrite free, and the beef has no added hormones. Halal Mummified Jerky is distributed by Timeline Trading, and they are located in Bellevue, Washington. 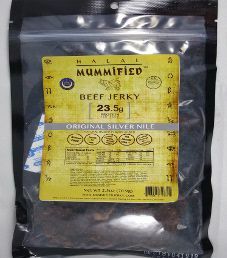 The next review on Halal Mummified Jerky will be on a 2.5 ounce/70 gram bag of their Original Silver Nile flavored halal beef jerky. Halal means food that is allowed for consumption under Islamic dietary guidelines. The aim is for a Muslim to slaughter the animal, limiting the amount of pain the animal will endure. The jerky bag was kindly submitted for review by the owner Ahmed Kamel. The liquid marinade used here is comprised of a decent soy sauce, a very respectable brand of Worcestershire sauce, liquid hickory smoke, and healthy lemon juice. 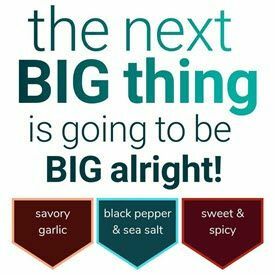 There are multiple healthy ingredients added such as black pepper, spices, onion, garlic, granulated onion, and paprika oleoresin. The sugar level is low at only 1 gram of sugar per 28 grams of jerky. While the salt level stated is low at only 105mg of salt per 28 grams of jerky, we believe it to be inaccurate based on the salty taste alone. 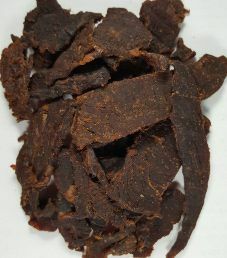 These strips of jerky are mostly medium in size, and they are sliced to a thin to a medium thickness. The texture is in between being soft and dry, and reasonably easy to chew. The fragrance of this jerky is really pleasant and inviting, with a myriad of aromas. The first taste recognized is a surprisingly strong level of saltiness. Even a salt fiend may find the salt level to be too high here. Chewing more brings on light levels of black pepper and garlic. The bite finishes off with a good ratio of soy and Worcestershire sauce. There is little sweetness present, a good thing in our books. As a result, the natural beef flavor is more noticeable, as is a subtle taste of smokiness in the background. The verdict is in, all three of us were unanimous with a Very Good (9/10) taste rating. If you enjoy salty jerky, the taste of soy, and a good amount of natural beef flavor, look no further than this Original Silver Nile beef jerky flavor. There are no slogans printed on this bag. Some facts printed on this bag are “22.5g Protein Per Package”, “Natural Smoke Flavor Added”, “12.5g Sugar Per Pack”, “Gluten Free”, “Premium Halal Blood Drained Meats”, “No Added Nitrates or Nitrites”, “No Added MSG”, “Made in USA”, “Hand Slaughtered Blood Drained Halal” ,and “Made in U.S.A. with premium meat exclusively for Timeline Trading”. The only missing bag category is a blurb printed about Halal Mummified Jerky and this Original Silver Nile flavor. A halal certified symbol is printed on the bag.